June 2011 – CREATE. PLAY. TRANSFORM. Introduction to centering the clay with the potter’s wheel is the fifth session in The Basics of Hand Building Techniques. After familiarizing the students with the earthy material, which is stoneware clay, I show them some spinning action in preparation for The Basics of Wheel Throwing. 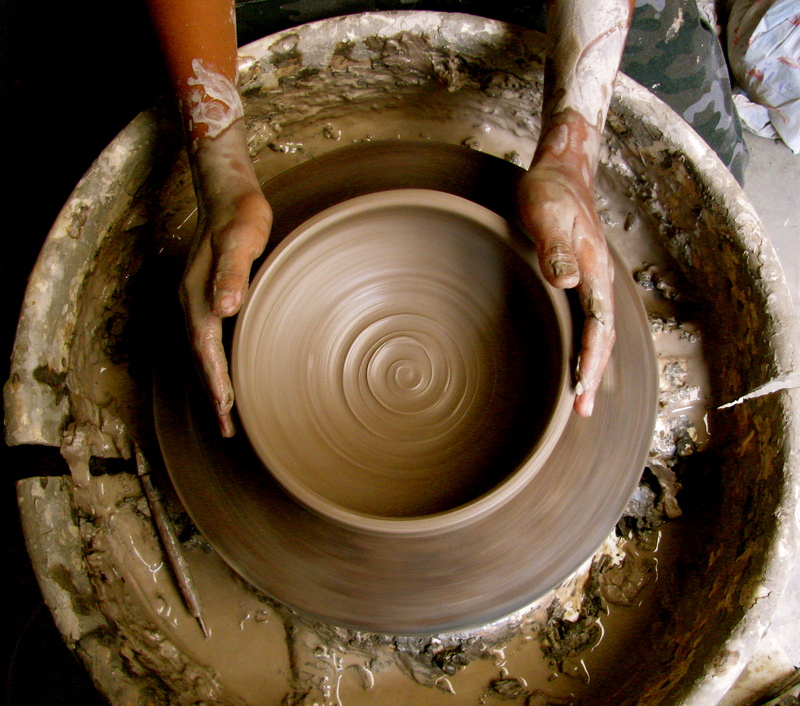 What does “Throwing” mean in making pottery? The Old English word, “thrawan”, from which to throw comes from, means to twist or turn. Going back even farther, the Indo-European root *ter- means to rub, rub by twisting, twist, turn. The German word drehen, a direct relative of to throw, means turn and is used in German for throwing. Because the activity of forming pots on the wheel has not changed since Old English times, the word throw has retained its original meaning in the language of pottery but has developed a completely different meaning in everyday usage. Those who say they “throw” pots are using the historically correct term. Those who say they “turn” pots are using more current language. Both are saying the same thing. (By Dennis Krueger from Ceramics Today). 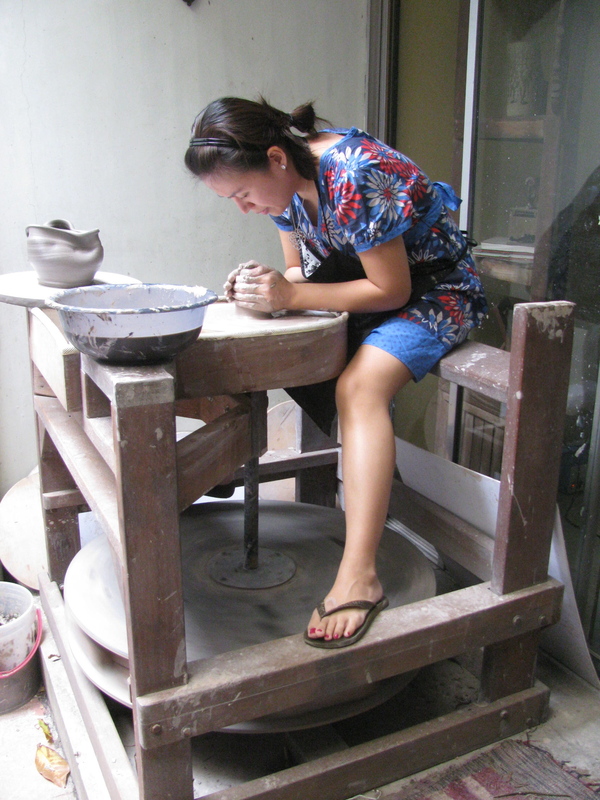 Take a look at some of the students who dared to get dirty with clay on the spinning wheel! The Pottery Studio has one electric wheel and one kick wheel. To those who are more daring, they choose the kick wheel. There is a correct posture to follow here too! Elbows on the lap, back slightly bent forward, and a good full kick with one leg is needed. Stretching is a must before and after making pots. When the pot is too large and reaching the elbows is impossible, placing the elbows on the torso helps a lot too. A good amount of speed is needed when centering the clay. I usually ask the students to kick the wheel first without forming the clay for the first ten minutes. It’s quite a leg exercise if you ask me! 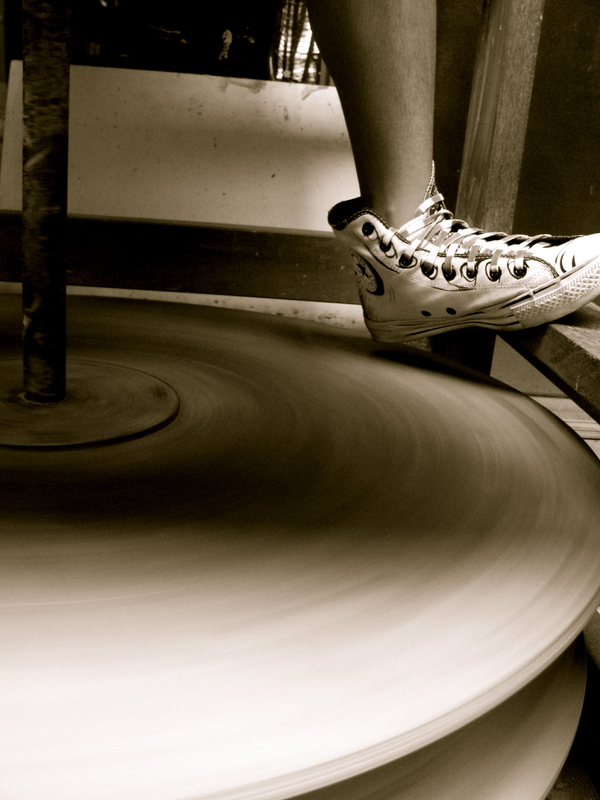 The wheel gets slow when too much pressure is applied on the clay. Sensitivity to the slowing down of the wheel is important. 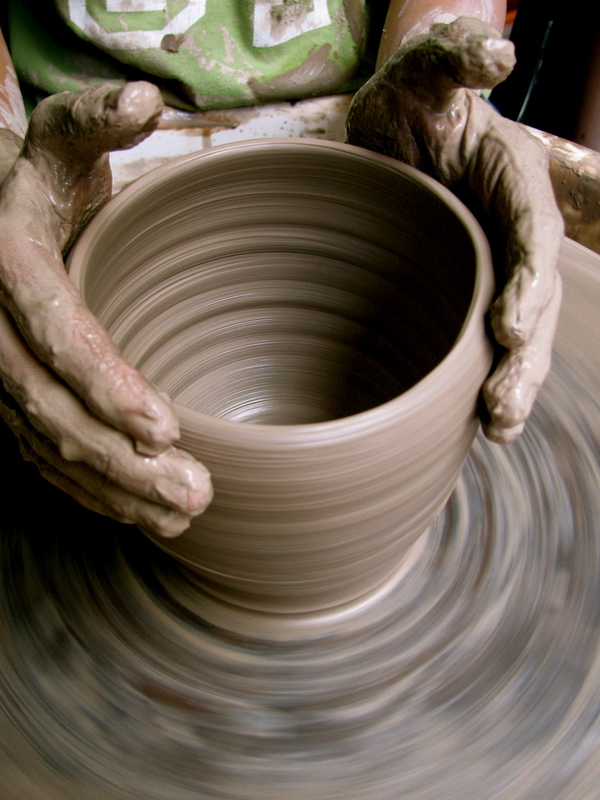 The clay tends to wobble when it is being pushed too hard to be formed on a slow wheel. The white splash pan can be removed and cleaned after making some pots. An electric wheel is easier to transport anywhere too! 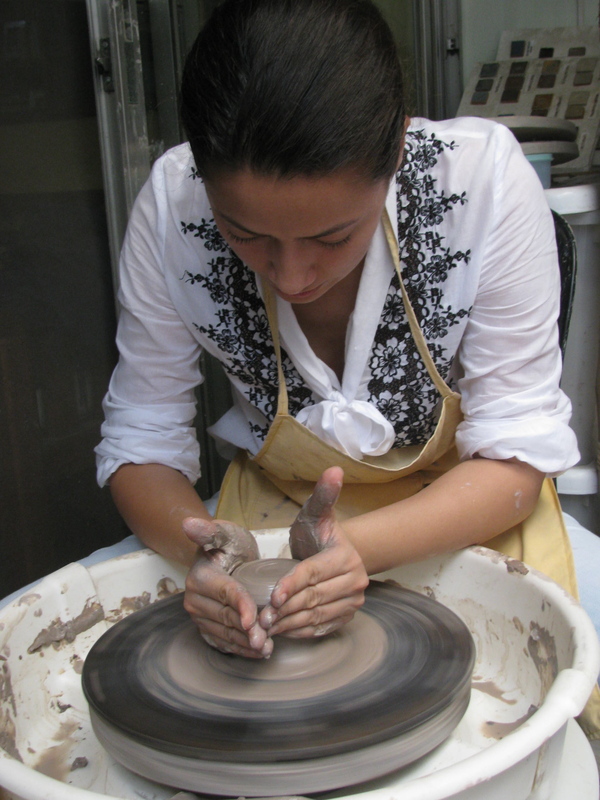 A lot of pots can be made with the use of the potter’s wheel: Plates, mugs, cups, teapots, tea cups, pitchers, bowls, vases, jars, oil burners, and a lot more! But a lot of patience is needed to learn this technique as well. 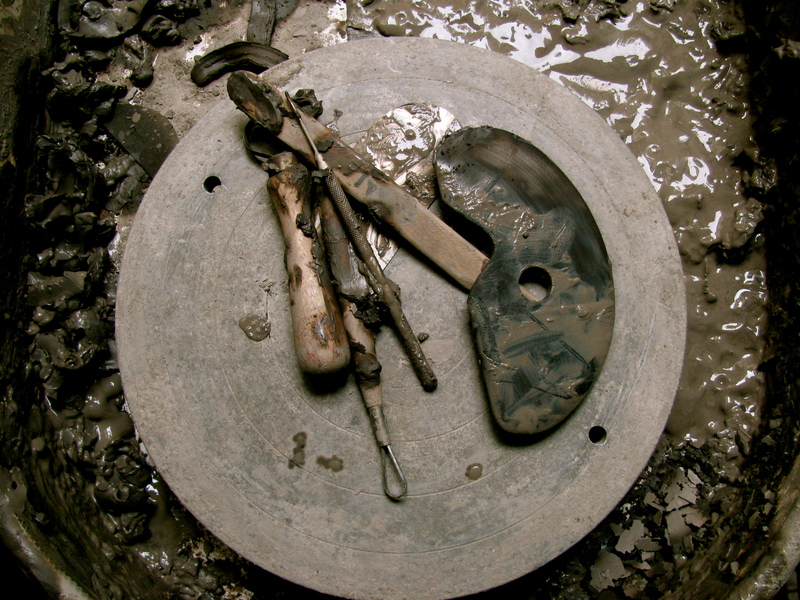 Here are some muddy tools that are used to make finer pieces. This wooden rib with a hole in the middle is used for creating big bowls. The needle tool is used for checking the thickness of the pots, for scouring clay, and for making holes. And the others are ceramic loop tools that are used for trimming the body/footing of the pots. The Basics of Wheel Throwing is the next lesson after The Basics of Hand Building Techniques. There are six sessions too, which includes glazing the pots on the last meeting. 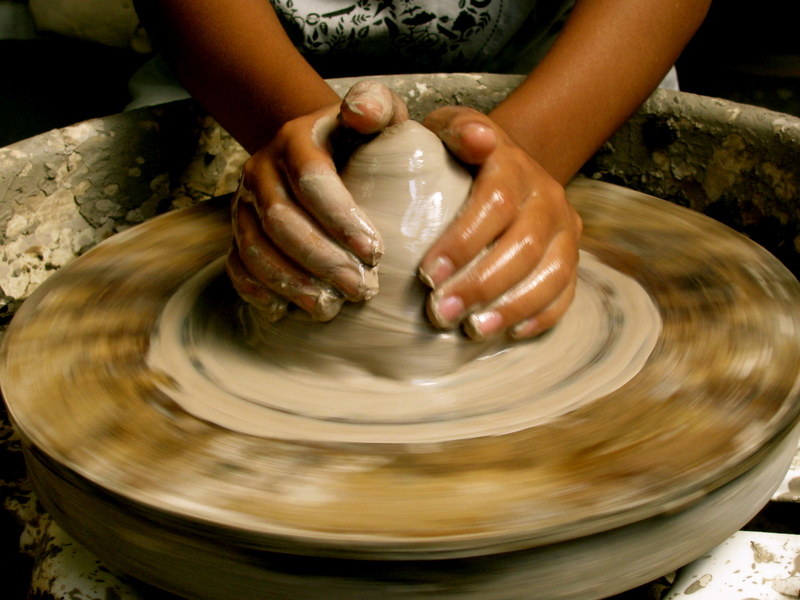 Get those hands dirty with clay and experience something new. Know why working with clay is “therapeutic”. The only way to find out about its benefits is when you finally try it! Please visit http://clayave.weebly.com to see more details about the muddy workshop. 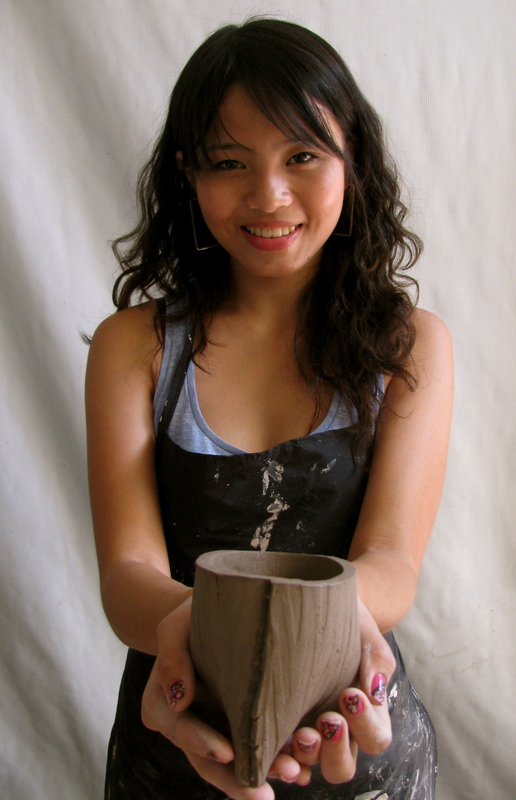 Working with clay is not just about throwing pots with the use of the potter’s wheel. A lot of functional and decorative pots are formed by some basic tools, a good table, and a lot of patience. One of the basics in Hand Building Pottery is called “Slab Making”. A lot of projects can be made with this technique: plates, platters, vases, wind chimes, pendants, bowls, wall decor, tiles, etc. It is used by a lot of potters around the world because of its endless possibilities in creating a diverse style in making pots and sculptural pieces. Materials needed: Canvas or “Katsa”, rolling pin, 2 slats of wood, slip, fettling knife or clay cutter tool, and a pin tool or barbecue stick. The cloth is where the clay will be pressed on. The rolling pin is used for thinning out and stretching slabs of clay. 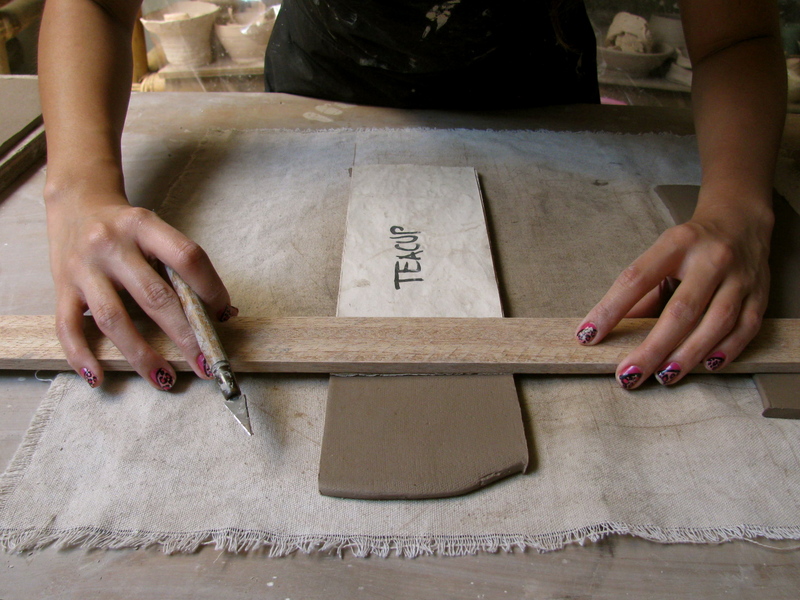 Two slats of wood (one on each side of the clay) are used for measuring the thickness of the clay. A pin tool is very helpful for scoring clay. Scoring is basically scratching lines to the surface of the clay. Slip is bone dry clay that is crushed and melted with water. It serves as the binding material in pottery. Slip is dabbed on to the scored surface before putting attachments (spout for teapots, handles, lugs, additional walls for vases, etc). Clay is being rolled out here with a rolling pin. Making sure that there is no crease coming from the cloth to avoid any crease marks on the clay. Sandra is going to make six cups out of six slabs of clay. She is using one template so it will be easy for her to make the same size for all cups. She uses one of the wooden slats to cut through the clay with the clay cutter tool. There will always be extra clay from the whole slab. These extra pieces of clay is placed back in plastic bags. They can still be used and added to other extra clay from making the whole project. They have to be stored in plastic bags, to keep them from drying too quickly. 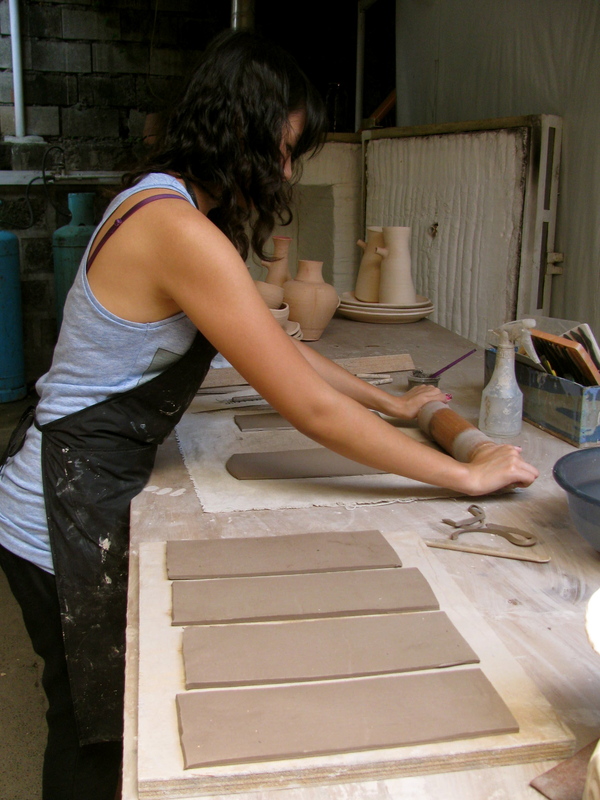 Sandra continues to make slabs of clay from the same template for her cups. She will make six of these and use rubber stamps to put texture on her clay. I encouraged her to use different patterns, so it will not look like a boring set with similar prints. They don’t have to look all the same, which is really the beauty of handmade pots. These cups have similar height. Some are thick. Some are thin. 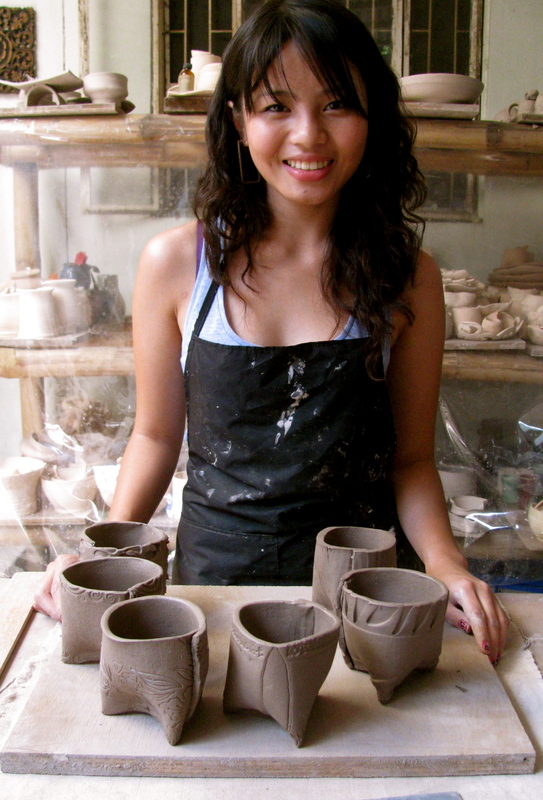 It is her first time to work with slabs of clay. It takes time and a lot of patience to achieve similar thickness with this technique. But the good thing about it is this: The more you do it, the more you will be good at it. Now this cup is ready to sit on a shelf to get dry and be ready for Bisque Firing!